Normally opossums are not aggressive and will not attack when unprovoked. However, if they think they are in danger, their children are in danger, or if they are very hungry, some problems may arise. The animal may go into attack mode and may end up biting you. Fortunately, this rarely happens when a person wants to trap an opossum and relocate it to another area. On the rare occasion that it does happen, wearing gloves will help protect the handlers from bites and scratches. 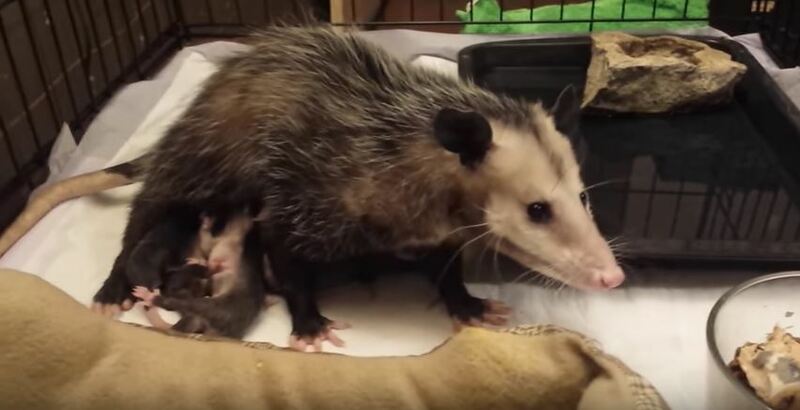 Opossums are carriers of several diseases that can be transmitted to humans, and this is another reason you should never handle an opossum with your bare hands. When it comes to handling wild animals, it is better safe than sorry. You should take many precautions before coming into contact with any wild animal. Wearing protective gear is highly recommended, and this includes wearing thick rubber or leather gloves. When possible, it is best that you not handle an opossum or most other wild animals with your hands at all. If you need to catch an opossum on your property or in your house, there are many effective traps available in the market that can take care of that for you. Even when you release the opossum in a new location, you should not have to handle the animal by hand. You can simply transport the trap, set it on the ground in the new location and open the door to release the animal. Even in these situations you should wear protective gloves, just in case. You do not want to take the chance of coming into contact with any parasites or bacteria from the opossum and accidentally transferring these from your hand to your mouth. If you are bitten by an opossum, you will need to get checked by a medical professional very quickly to ensure that the animal has not transmitted any diseases to you. In that case, the animal will probably need to be taken for testing as well. If you want to avoid handling the opossum altogether, you can contact a wildlife removal specialist. They can come to your house and capture any opossums that may have taken residence on your property or within any of the structures on your property. These professionals will certainly be wearing gloves as well to protect their hands at all times. Go back to the How to Get Rid of Opossums page or email us if you have any other questions about Is it safe to handle an opossum with bare hands?